Ideal for sophisticated style in a small dining space, this compact drop leaf table set seats up to four diners. 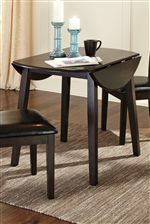 The table is made with select birch veneer and hardwood solids in a transitional dark brown finish with gray undertones. You will love how the drop leaves help save space within your dining space to make this table a versatile piece for your kitchen nook. With their simple styling with slat backs and dark brown vinyl upholstered seats, the side chairs complete with table set with comfortable seating. The Griffin 5-Piece Round Drop Leaf Table Set by Signature Design by Ashley at Crowley Furniture & Mattress in the Kansas City Area: Liberty and Lee's Summit, MO & Overland Park, KS area. Product availability may vary. Contact us for the most current availability on this product. Casual contemporary design and multi-functionality make the pieces from this dining collection perfect for small spaces. 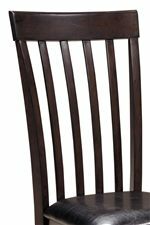 The round drop leaf table and slat back side chair with an upholstered seat are each constructed with select birch veneers in a transitional dark brown finish with gray undertones. The Griffin collection is a great option if you are looking for Casual furniture in the Kansas City Area: Liberty and Lee's Summit, MO & Overland Park, KS area. Browse other items in the Griffin collection from Crowley Furniture & Mattress in the Kansas City Area: Liberty and Lee's Summit, MO & Overland Park, KS area.